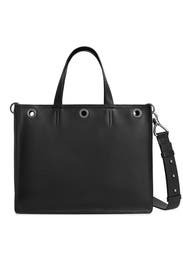 Sleek, and spacious, this All Saints tote is a much needed additional to your everyday look. 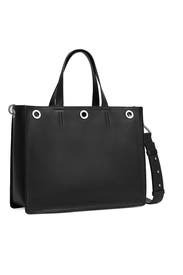 Black smooth leather E/W tote with industrial metal eyelets. Top zipper closure and interior leather slip pocket. Top handles and adjustable crossbody strap. 11.5"H x 14.8"W x 5.5"D.